Abstract: Monazite age dating, detrital heavy mineral content and whole-rock geochemistry provided insight into the provenance, depositional history and paleogeological setting of the Radlovac Complex very low- to low-grade metasedimentary rocks (South Tisia, Slavonian Mountains, Croatia). Electron microprobe based Th-U-Pb dating of detrital monazite indicates a Variscan age of the protolith (330±10 Ma). The detrital heavy mineral assemblages of representative metasedimentary rocks are dominated by apatite, zircon, tourmaline and rutile accompanied by minor quantity of epidote/zoisite, monazite and titanite. Judging from the heavy mineral assemblage, felsic igneous rocks served as the source material. This is consistent with the major and trace element spectrum of studied metasedimentary rocks characterized by high concentration of Th, high L+MREEs and high ratios of La/Sc, Th/Sc, La/Co, Th/Co and Th/Cr. The occurrence of magmatic monazite, zircon and xenotime and the absence of metamorphic heavy minerals suggest that granitoids, migmatites and migmatitic gneisses served as one major source for the metapsammites. Such rock types are commonly exposed in the Papuk Complex of the older surrounding complexes, while the Psunj Complex also contains metamorphic rocks. This is in good correlation with the monazite ages presented here which fits better with ages of Papuk Complex representative rocks than with those of the Psunj Complex known from the literature. Overall, data show that the Radlovac Complex represents the detritus of the local Variscan crust characterized by granitoid bodies, migmatites and migmatitic gneisses typical for the Papuk Complex. 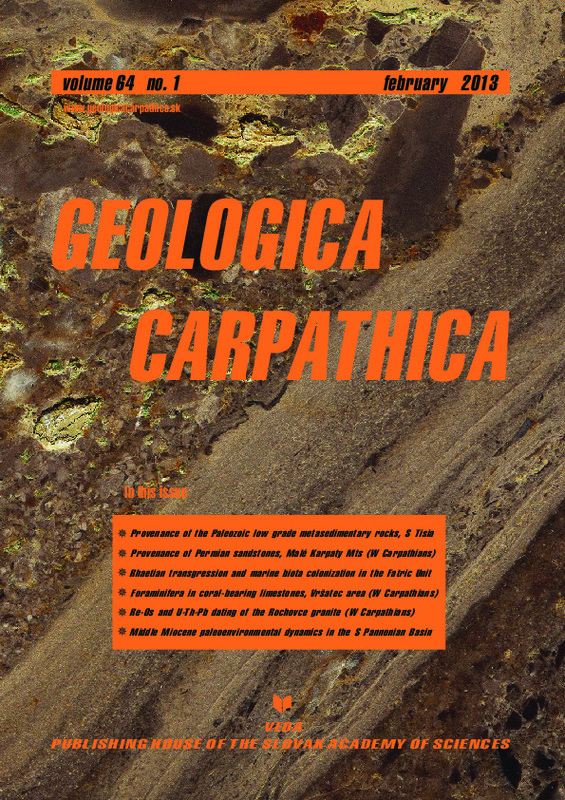 Abstract: The Permian sandstones of the Maluzina Formation in the northern part of the Male Karpaty Mts are dominantly quartzofeldspathic and quartzolithic in composition with abundant feldspars and volcanic, plutonic igneous and less metasedimentary lithic fragments, indicating the sand grains were derived from a basement uplift and recycled orogen. The Maluzina Formation sandstones have moderate to high SiO2 contents (68–85 wt. %; on average 76 wt. %), TiO2 concentrations averaging 0.3 wt. %, Al2O3 contents of about 12 wt. %, and Fe2O3 (total Fe as Fe2O3)+MgO contents of around 2.9 wt. %. The Chemical Index of Alteration (CIA) values for the Permian Maluzina Formation sandstones vary from 45 to 68 with an average of 55, indicating low to moderate weathering of the source area. The bulk chemical composition and selected trace elements preserve the signatures of a felsic and intermediate igneous provenance, and suggest mostly an active continental margin tectonic setting of the source area for the Maluzina Formation sandstones. The Eu/Eu* (~0.78), La/Sc (~7.28), Th/Sc (~2.10), La/Co (~6.67), Th/Co (~1.85), and Cr/Th (~6.57) ratios as well as the chondrite-normalized REE patterns with flat HREE, LREE enrichment, and negative Eu anomalies indicate derivation of the Maluzina Formation sandstones from felsic rock sources. The deposition of the Maluzina Formation sandstones took place in a rifted continental margin environment supplied from collision orogen on a thick continental crust composed of rocks of older fold belts. Abstract: Terminal Triassic environmental changes are characterized by an integrated study of lithology, litho- and cyclostratigraphy, paleontology, mineralogy, geochemistry and rock magnetism in the Tatra Mts. The Carpathian Keuper sequence was deposited in an arid environment with only seasonal rivers, temporal lakes and swamps with scarce vegetation. Combination of a wide range of δ18O values (–0.7 to +2.7) with negative δ13C values documents dolomite precipitation either from brackish or hypersaline lake water, or its derivation from pore water comparably to the Recent Coorong B-dolostone. Negative δ13C values indicate microbial C productivity. Rhaetian transgressive deposits with restricted Rhaetavicula fauna accumulated in nearshore swamps and lagoons. Associations of foraminifers, bivalves and sharks in the Zliechov Basin were controlled by physical factors. Bivalve mollusc biostromes were repetitively destroyed by storms, and temporary firm bottoms were colonized by oysters and burrowers. Subsequent black shale deposition recorded input of eolian dust. Bottom colonization by pachyodont bivalves, brachiopod and corals started much later, during highstand conditions. Facies evolution also revealed by geochemical data, C and O isotope curves reflect eustatic and climatic changes and help reconstruct the evolution of Rhaetian marine carbonate ramp. The Fatra Formation consists of 100 kyr eccentricity and 40 kyr obliquity cycles; much finer rhythmicity may record monsoon-like climatic fluctuations. Fluvial and eolian events were indicated by analysis of grain size and content of clastic quartz, concentrations of foraminiferal (Agathammina) tests in thin laminae indicates marine ingression events. Magnetic susceptibility (MS) variations reflect the distribution of authigenic and detrital constituents in the sequence. Increasing trend of MS correlates with the regressive Carpathian Keuper sequence and culminates within the bottom part of the Fatra Formation. Decreasing trend of MS is observed upwards the transgressive deposits of the Fatra Formation. Abstract: The paper deals with benthic foraminifera occurring with the scleractinian corals in the Jurassic biohermal and peribiohermal coral-bearing limestones of the Vrsatec area (Czorsztyn Succession, Slovak Pieniny Klippen Belt). The coral community is dominated by branching forms of the genus Thecosmilia. Co-occurring abundant benthic foraminifera belong to the species Rumanolina seiboldi, R. elevata, Paalzowella turbinella and Troglotella incrustans. The coral-bearing limestones were initially assigned to the Oxfordian on the basis of the microfacies analyses and bivalve and scleractinian faunas. In recent papers they are assigned to the Bajocian on the basis of ammonites found in the neptunic dykes and stratigraphic superimposition criteria. However, the stratigraphic distribution of the majority of the identified foraminifera indicates that like most scleractinian coral taxa they are not known earlier than in the Late Jurassic. The Late Jurassic age of these coral-bearing limestones is also suggested by an encrusting microproblematic organism Iberopora bodeuri. Abstract: The subsurface Rochovce granite intrusion was emplaced into the contact zone between two principal tectonic units (the Veporic Unit and the Gemeric Unit) of the Central Western Carpathians (CWC), Slovakia. The Cretaceous age of this granite and its Mo-W mineralization is shown using two independent methods: U-Pb on zircon and Re-Os on molybdenite. The studied zircons have a typical homogeneous character with oscillatory zoning and scarce restite cores. SHRIMP U-Pb data provide an age of 81.5±0.7 Ma, whereas restite cores suggest a latest Neoproterozoic–Ediacaran age (~565 Ma) source. Zircon εHf(81) values –5.2 to +0.2 suggest a lower crustal source, whereas one from the Neoproterozoic core εHf(565)=+7.4 call for the mantle influenced old precursor. Two molybdenite-bearing samples of very different character affirm a genetic relation between W-Mo mineralization and the Rochovce granite. One sample, a quartz-molybdenite vein from the exocontact (altered quartz-sericite schist of the Ochtina Formation), provides a Re-Os age of 81.4±0.3 Ma. The second molybdenite occurs as 1–2 mm disseminations in fine-grained granite, and provides an age of 81.6±0.3 Ma. Both Re-Os ages are identical within their 2-sigma analytical uncertainty and suggest rapid exhumation as a consequence of post-collisional, orogen-parallel extension and unroofing. The Rochovce granite represents the northernmost occurrence of Cretaceous calc-alkaline magmatism with Mo-W mineralization associated with the Alpine-Balkan-Carpathian-Dinaride metallogenic belt. Abstract: Paleoenvironmental analysis based on foraminiferal distribution has been carried out on 44 sediment bulk samples from the locality Bogutovo selo near Ugljevik (NE Bosnia and Herzegovina). During the Middle Miocene the region was positioned on the southern margin of the Pannonian Basin and the Central Paratethys Sea. The studied section comprises ≈70-m-thick sedimentary succession dominated by marine marls and intercalated in its middle part by a single 14-m-thick limestone package. Marine succession superposes by angle discordance Oligocene coal-bearing deposits. The marker species allow correlation of the lower part of the section with the Early Badenian Upper Lagenidae Zone, whereas for the middle and upper part, the Middle Badenian Spirorutilus Zone was inferred. Integrating data from calcareous nannoplankton, the stratigraphic range has been limited to the time interval of 14.36–13.65 Ma (late NN5, late Langhian). The statistical agglomerative techniques applied to benthic foraminiferal distribution suggest the presence of six assemblages showing gradual transition from one to another. Their paleoenvironmental significance points to initial upward deepening of the depositional environment as a result of the Badenian transgression. This trend is interrupted by major sea-level-fall and switch to carbonate platform conditions in the middle part of the section. Subsequent sea-level-rise and increased primary production resulted in progressive reduction of oxygen content at the sea bottom in the upper part of the section. The stratigraphic position in the topmost NN5 Zone implies the correlation of the major sea-level-fall with the glacio-eustatic isotopic event Mi-3b astronomically dated to 13.82 Ma and coinciding with the base of the Serravallian.